I am an unabashed humor and improv nerd—and I mean visibly nerdy from space. At eight, the very first presentation I gave to a class was on Harold Lloyd, Hollywood’s silent film-era comedy stuntman. Oh, and I dressed the part, too. I’ve managed teams in marketing, and I’ve been performing comedy on a stage for almost 2 decades—stand-up, improv, and sketch. Last year, I did a one-woman show. Holy smokes, did it push me, and I am grateful. All of it has been an incredible education in collaboration, creativity, communication, and playfulness. Each of us has a kid inside waiting to play, no matter our age. The big reason I believe in improv is that it means playfulness and personal growth. As a business owner, author, speaker, and business storyteller, it has made me better. It has made my connections with people deeper and my life richer. I use it in my work with clients (and in my business) to be more creative and to have idea orgasms—yes, you read that correctly! Improv has changed my world, and that isn’t a comical exaggeration. I think it can help people be better in business and in life. 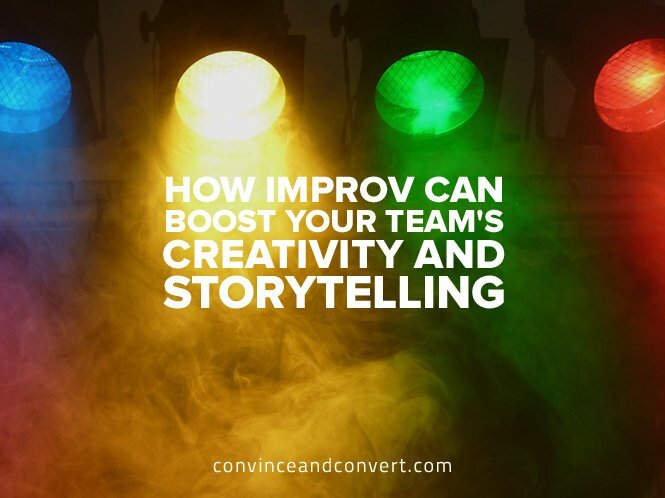 When people hear “improv,” they often hear “theatrical performance.” It’s bigger than that. I’d like to frame it as taking tools from the stage and using them to achieve better business outcomes offstage in fast-paced, dynamic environments. The applications for improv extend far beyond speaking and communications (the low-hanging fruit) into risk-taking, creativity, and collaboration. These are essential for innovation. Oh, and the bonus? It’s a lot of fun! And it has made me more creative and playful. So, yes, Virginia, there is a Santa Claus, and the improv version will make you funnier. So if you want to be a more masterful funny person, improv will shape that. The real gift lies in being a better businessperson and a better storyteller. Here are five ways improv can take your storytelling to an 11 that would make Spinal Tap proud. The central tenet of improvisation is “yes, and.” That means in every scene, in order to move the story forward, we accept each others’ choices rather than deny them. The “and” involves adding onto the choice, so that ideas gather steam and advance the story. Imagine you are the person on the receiving end of a “yes, but” on every idea you generate. At some point, not only will you want to strangle the person doing this to you, but you’ll also stop trying. This mentality kills ideas before they have a chance to evolve. We do this every day in business, and for most of us, it happens at an unconscious level. Now change your “yes, but” to a “yes, and” or “tell me more” (It doesn’t have to be a literal “yes, and”). Watch how the energy of the conversation changes. Outcomes will be better, more positive, and you’ll turn a conversation around pretty quickly. A “yes, and” doesn’t mean you’ll implement every idea; it simply means, “I hear you, and let’s keep innovating.” That attitude opens people up rather than shutting them down. You’re not marrying every idea; you’re simply taking them out for a few drinks! “Yes” is also about taking risks. Richard Branson writes that you should say, “Yes, yes, yes,” to opportunities even when you don’t know how you’ll accomplish something. I agree. “Yes, and” is also about saying yes to possibilities and to yourself. Give yourself permission to do, try, evolve, and grow. You don’t always have to have the answers. Life is improv. When you get that call to do something incredible, say yes. Deal with how later. Listening is the most important element in improvisation. Most of us live our lives in our heads—even me, sometimes, and I have to catch myself. Improv will heighten your awareness. When we are in conversation with someone, we’re spending most of that energy thinking about what we are going to say next, rather than listening to what the person is really saying to us. That is a huge challenge today with so much coming at us. Even seasoned improvisers have to work at it. We filter for survival. As author Ekaterina Walter says, we’re in the age of “infobesity.” It’s a brutal reality that has our attention span under constant assault. Listening opens the door to “yes, and,” so that gifts and offers of ideas can be received and built on. That’s the corollary to great listening: It allows us to co-create something better together than we could create on our own. Improvisation is an ensemble activity, and you have to make your onstage partner look good. This is also the central focus of any high-functioning business team. When you listen by being fully present and clearing your head of any canned ideas, you give the gift of being fully present. That allows team members to deepen relationships and create better outcomes for the team, organization, or group. Every team member wants to be heard and seen. It’s the only way co-created ideas can advance the group story. It sounds oxymoronic, and it is. We know that growth involves risk-taking. Improv involves taking risks in order to see what works. In a group of supportive players, it’s a safe environment to play. That part is key: creating a safe place to experiment, make mistakes, and learn. Here is the reality for anything in life and business: The more hung up we are on being right, the less we take risks. Being a great improviser means learning to let go of being right, of being the focus of every scene, and of being funny. Yes, that’s a big one—the more you try to be funny, the greater the likelihood you won’t be. Every great comedy coach I ever had said to me, “Have the courage to not be funny.” When you let go of driving every outcome or trying to look good, you have more fun, and you’re able to enjoy the journey. That is precisely where joy, play, and success happen. That is true in business teams, as well. Einstein wrote that knowledge (and I would add, “growth”) is inversely proportional to ego. The more the ego tries to look good, the less it is willing to risk being wrong. That kills growth. What’s more important to you: being right or growing in knowledge and ability? I know which one I choose, every time. In improv, we generate ideas without judging them. In a creative sense, there is no right or wrong. Improv helps us see things backwards, upside down, sideways, through mash-ups, and in entirely new ways. Thinking like an improviser and using exercises from improvisation can help businesspeople think more creatively about challenges and generate better ideas for solving them. We’re all improvisers on a business stage. Improv embraces imperfection because marketing and brands, like people, are imperfect. That makes great storytelling. In improv, there is no failure in the strict sense. You try something, maybe it doesn’t work as expected, and you move on. Mistakes are celebrated because they help us learn. In improv, little moments of imperfection make scenes better. When improvisers break character and laugh, when they get names wrong, when they poke fun at each other on stage—these moments are all gifts that make stories better and audiences crack up. Stories, like people, are not perfect. Imperfections make things fun, human, relatable, and real. Too often in business, stories are boring because they are superficial, and brands are trying to be in control. Brand control is an illusion; like certain shades of blonde, it does not exist in nature! Now imagine telling stories about your company, your employees, your brand journey that are imperfect and yet so human that your audience not only connects with you, they champion your message because they see themselves in it. Real stories always win. So do real people. Leaders that are adaptable know when to try new things and move on. Marketing, business, and life require adaptability. Every day unforeseen stuff—both good and bad—happens. Leaders plan, and they also know when to let go and improvise. Improv is about letting go, growing, and failing in a safe environment in order to be better tomorrow than you are today. That’s no different from what any great businessperson wants. Yes, improv will hone your comedy chops. Yes, and . . . it will give you so much more than that!